Toronto drivers have a lot to learn, according to a new report from The Centre for Active Transportation (TCAT), Learning to be a Bicycle Friendly Driver. 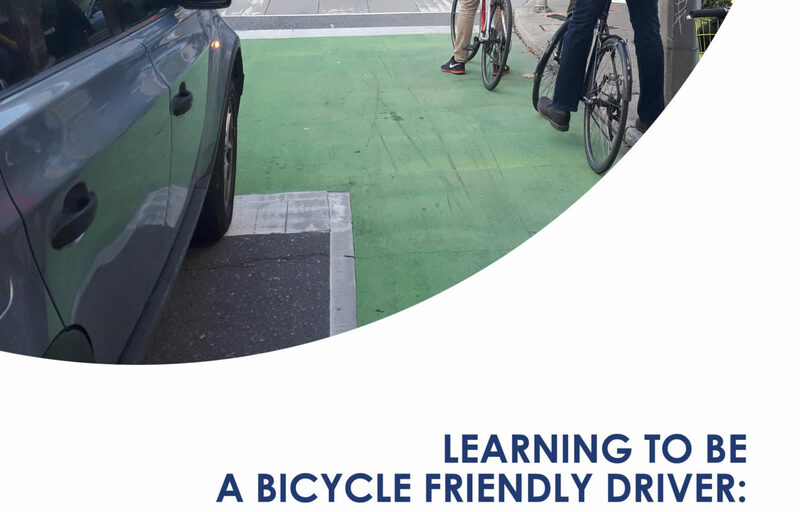 The report looks at the feasibility of offering additional training to drivers in Toronto (both professional and the public), with the goal of helping them more safely share the road with people on bikes. The findings reveal an urgent need for this type of training and an unprecedented willingness on the part of businesses to engage with safe cycling issues. The report investigated bicycle friendly driver programs currently being offered in Fort Collins, Colorado and San Francisco. In both locations, municipal transit, as well as many private transportation and delivery companies have their drivers undergo training on this topic. The report identifies key requirements for success for a Toronto program. They include strong municipal involvement, a parallel bicycle training program, and strong public support for road safety. Toronto’s Vision Zero Road Safety Plan could offer an ideal platform for launching a bicycle friendly driver program in Toronto because of its emphasis on education, and its ability to draw together partners from different sectors. Council will vote on an increase to the Road Safety Plan’s budget in February. “Education is one of the four major pillars of Toronto’s Vision Zero Road Safety Plan to eliminate fatalities and serious injuries. As the City of Toronto is transitioning rapidly to new safer street designs, driver training needs to keep pace. As a partner agency working with the City to help us achieve our Vision Zero goals, TCAT’s new report is timely and relevant.” Roger Browne, Manager, Traffic Safety Unit, City of Toronto. New legislation, such as the 1-metre passing rule, new pavement markings and new signage require people driving to adopt new behaviours, yet most people have not undergone any training after obtaining their Class G license. Download a copy of the report, [download id=”15746″].